That’s one heck of a disappearing act by one of the game’s best offspeed pitches. 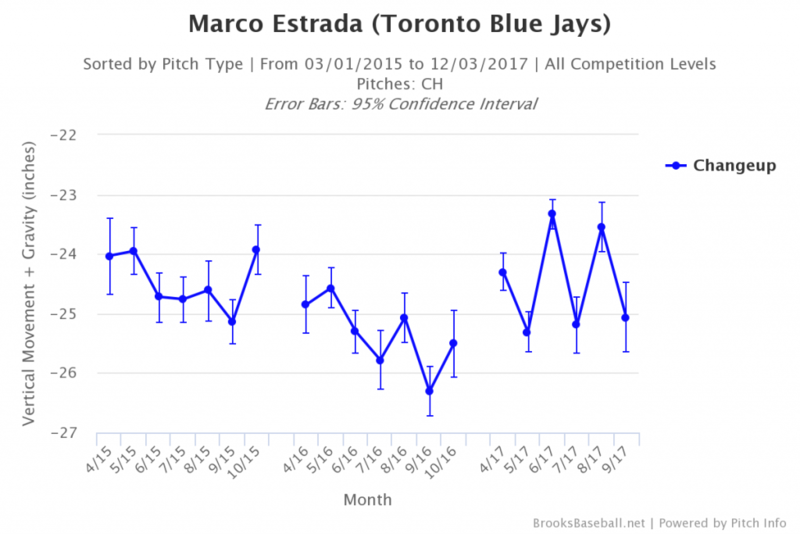 As you can see, Estrada actually only really struggled with the pitch in June and August, with a bit of a blip in April that happened to be helped along by an unusually stingy fastball. So instead of looking at the season as a whole, we should be looking at those individual months to see what was going on with Estrada’s changeup. That sure looks an awful lot like that slugging percentage chart above, doesn’t it? It follows reasonably logically. By the time the ball is getting to the plate, there is a two inch variance in where the pitch was ending up (assuming a similar release point). That’s a big difference when we’re talking about a bat that has a 2.61” barrel. For reference, take a look at the vertical movement (+ gravity) on the changeup over the last two years. We can ignore the two October readings — as they were both based on a single outing — and see that the vertical movement on his changeup tracks pretty well with the whiff rates on the pitch from that first chart above. Most importantly, all the months with the least amount of “drop” on the changeup occurred in 2017. But we’re still talking about the what. What we really need to get into is the why. 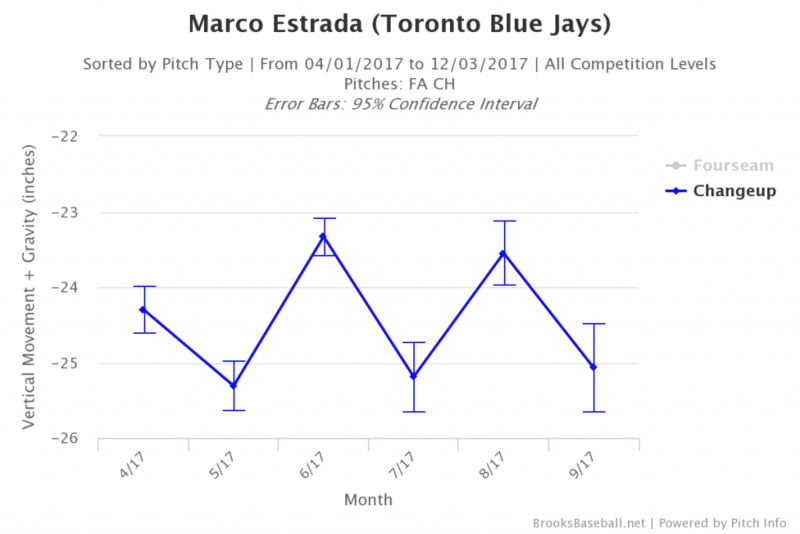 WHY did Estrada’s changeup get worse? There was no tangible change in spin rate (a difference in average RPM of a mere 29 revolutions, from 2154 to 2125), but there definitely was one in release point. 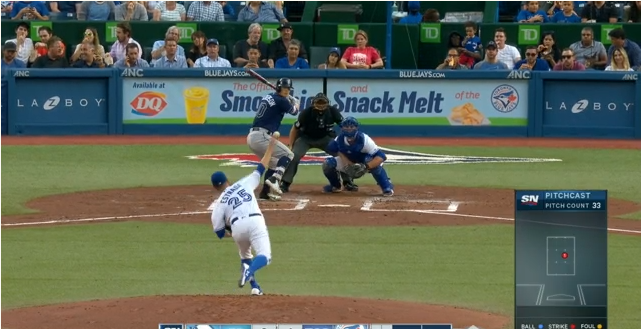 There’s a substantial difference in where Estrada was letting the ball go this year compared to last; the range there is a whole six inches of release horizontally. But as we said above, Estrada had some good months with the pitch in 2017. He was never getting the whiffs of 2016, but still solid. So let’s focus on 2017. The two months where Estrada happened to be throwing most over the top completely lined up with the months where his changeup fought gravity at the highest rate. That’s not a coincidence, of course. By coming over the top like that Estrada is changing the spin direction of the baseball. 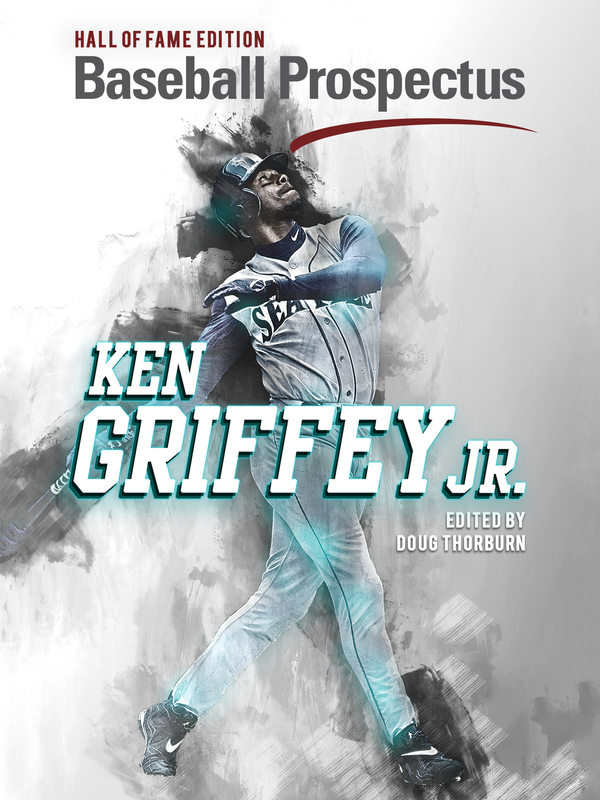 The closer he gets to true backspin, the more the pitch will fight gravity. In the case of his disappearing changeup, that just happens to be a bad thing (though it helps him with his fastball). When we look at the vertical release points we catch another issue. This is a changeup from April. This is a changeup from August. Estrada is really tilting his body in that second photo. If you’re having trouble seeing it, compare the left handed batters boxes in those two photos. 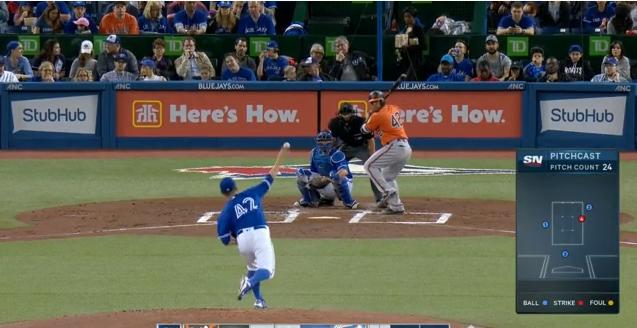 In the one from April, there’s a significant, visible gap between Estrada’s shoulder/neck and the line of the box. With no change in position on the rubber in the latter picture, he is almost completely obscuring the box’s outer edge. These are cherry-picked offerings (we can find occasional examples of each in any start), but they’re also very representative of what the average release point data is trying to show. 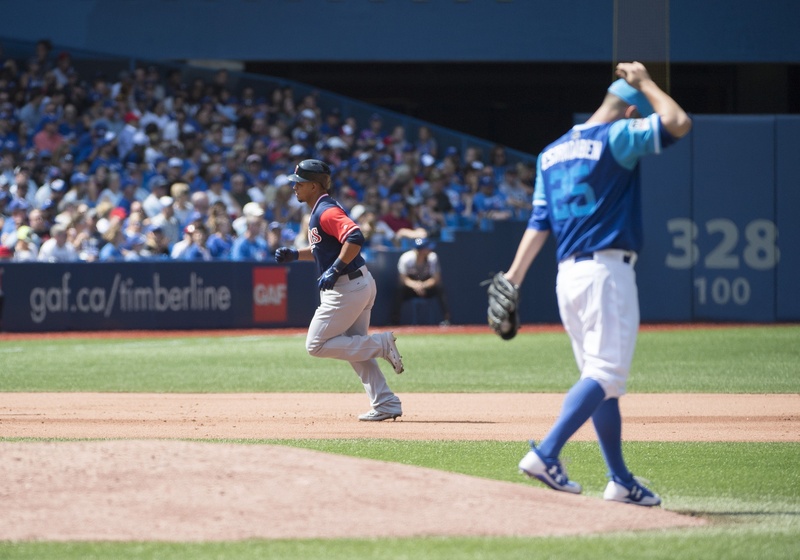 Estrada was pulling off the ball in August, resulting in lower vertical release (because he was bent over more), but also a release closer to his head. As such, he was still getting that “rise” on his changeup that he didn’t want, despite the lower release point. Those two heat maps couldn’t be more different. 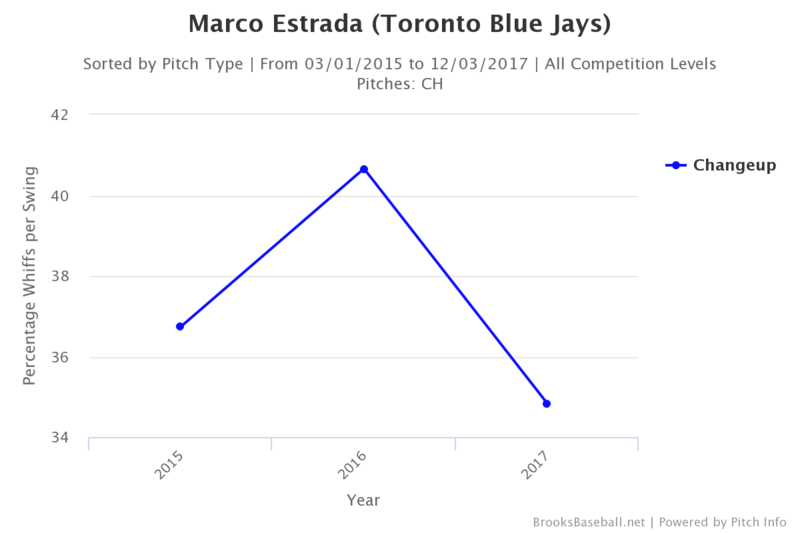 In 2016, Estrada had a very small area where most of his changeups ended up, with the rest of them radiating down and out of the zone, showing a clear intent. In 2017, the most frequented location is spread over a much bigger area in the middle of the plate, then radiating out in all directions. That’s a visible example of a lack of command. When you’re talking about pitch that relies entirely on deception for its effectiveness, being able to throw it where you want is pretty important. Estrada couldn’t. So inconsistent movement, inconsistent release, and inconsistent location. Yep, that would add up to a bad pitch. The obvious follow up, then, is what does all this mean going forward? Well, the good news is that he is aware of the potential issue in his delivery — which affected his fastball as well, as linked above. Secondly, the reason he was unable to make proper adjustments very easily could be related to the personal issues he was facing during much of the year. Mechanics are very much a mental aspect of pitching; if you’re having trouble getting into the right head space, they can go off pretty easily. For an extreme example, look no farther than what happened to Brad Lidge after Albert Pujols hit the ball 500 feet off him in a playoff game. 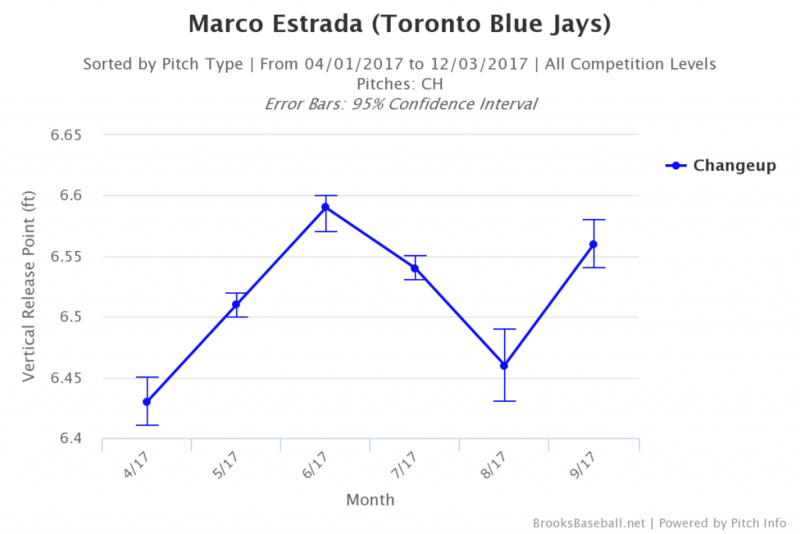 If Estrada is right mentally (and we have no reason to believe he isn’t) and able to continually focus on correcting these flaws (he seemed to make a minor adjustment in July, only to overdo things in August), then he should be closer to the pitcher we’ve seen the for most of the last three years. If not, we could see another up and down year from the 33 year old. Thankfully, we also have something of a track record to point to after three years of Estrada in Toronto, so the betting here is that he will be just fine in 2018. I think he was using it to often and the hitters were sitting on as he used it every batter. He did use it a bit more often, but only negligibly so (32% vs 29% in 2016 and 28% in 2015). That’s not nearly enough of a change to cause that kind of difference in success. Maybe just looking at the %s omits the element of batter expectations. If hitters were looking for it more often in 2017, it would have required them to adjust to it less often. Using hypothetical guessing rates in a simplified model, if hitters guessed change 20% of the time in 2016, they’d have been been right on 5.8% of his pitches (29% x 20%). If they realized he threw 29% in 2016 and upped their guess rate to 30% in 2017, they’d have been correct 9.6% of the time. The absolute absolute difference is only 3.8%, but the relative difference is much greater at 65.5%. You’re asking a different question than Gene. 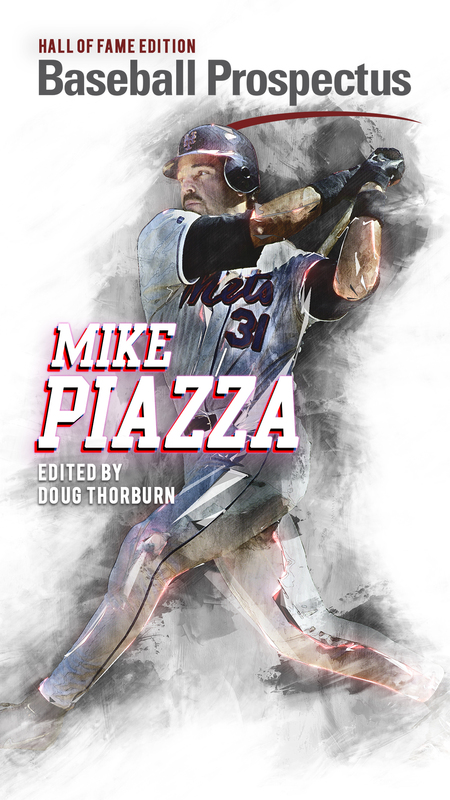 You’re talking about hitter expectation based on past usage. 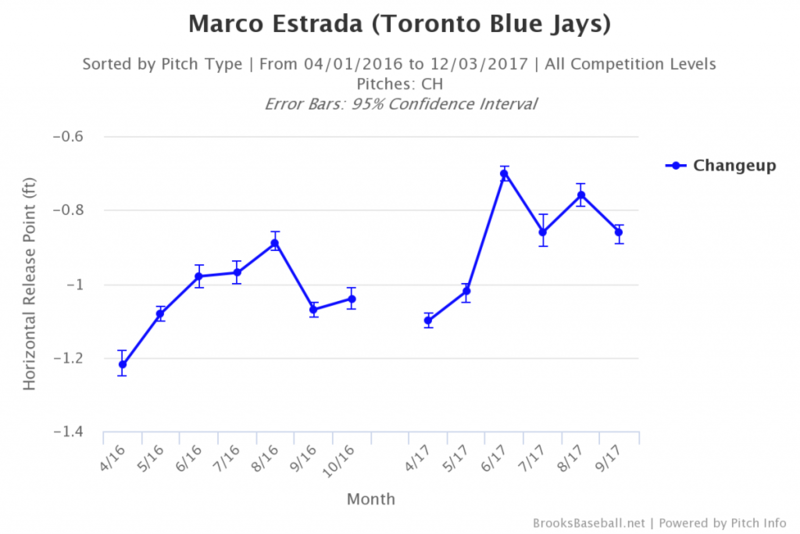 But in reality, Estrada has been between 28-30% each year between 2014-2016, before the 32% this year. Because of that, there’s no reason for hitter expectations to have changed dramatically from last year to this, and thus no reason for that to be even close to the main reason for the struggles with the pitch. So while your hypothetical would make sense, it doesn’t really track with any likelihood of matching reality. In addition, his usage in the two months where the pitch was at its worst, he actually threw it less often (28.4% in June, 25.5% in August) than any other month. Also, I don’t think hitters bring that kind of tendency data to the plate with them and guess pitches based on the information, though I could be wrong. Yeah, I don’t think hitters step to the plate thinking “he threw 29% changeups last year”, but otoh, it doesn’t seem out of the question that as he has continued to throw ~30% year after year, hitters didn’t immediately start guessing at that rate, and instead, have tended to increase how often they sit on it because the body of data supporting such a guess has gotten larger and larger. You should make a chart plotting 2017 monthly CH usage versus results. I suspect there were spikes in CH usage. I recall Estrada strugging through a start and he was throwing pretty much all changes at one desperate point. Hitters were laying off balls and sitting on strikes. Gibbons went to the mound and chewed him out. 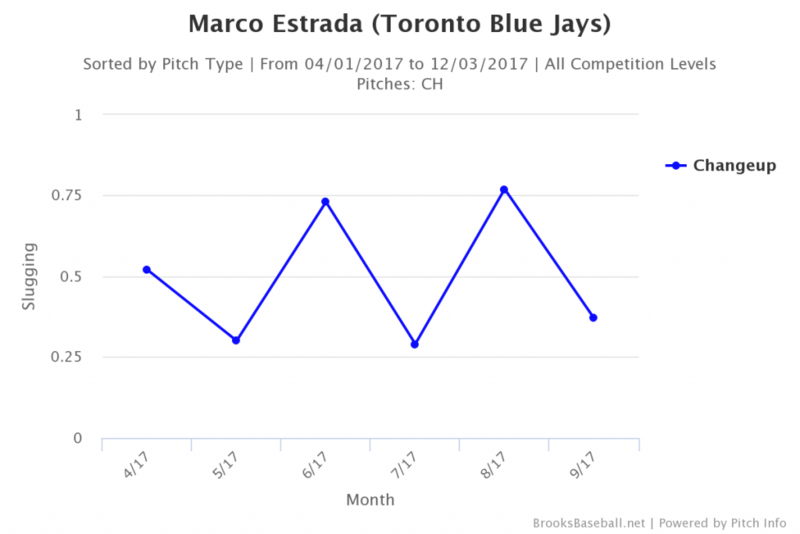 Estrada then threw seven or eight fastballs in a row. The months where his changeup was worst (June and August) were also the months where he threw it the least frequently. He was 28.4% in June, 25.5% in August, over 30% every other month.